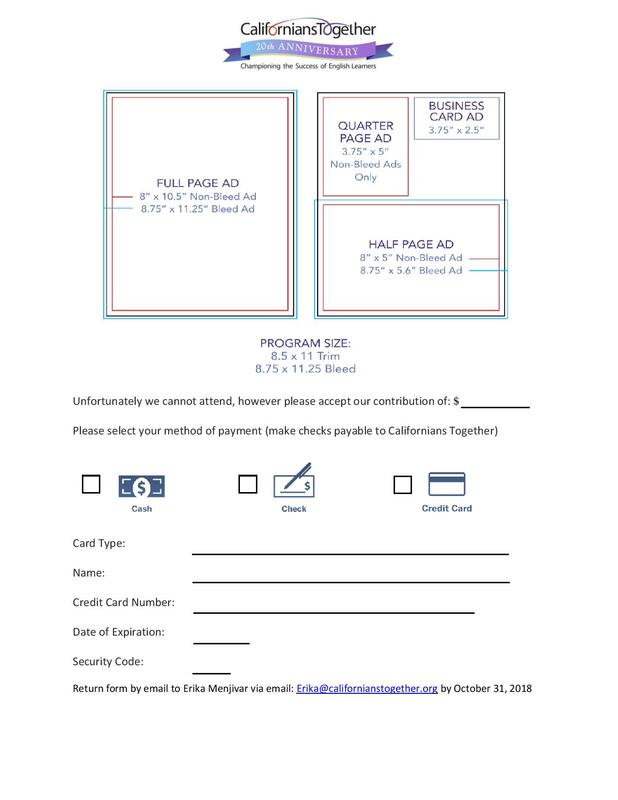 WHY SPONSOR OUR 20 YEAR GALA? 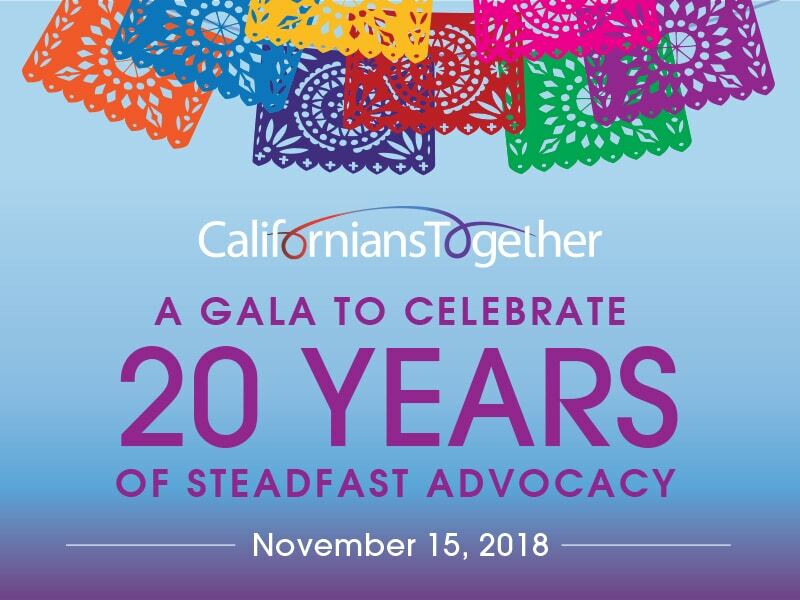 connect with a community of advocates and leaders who are celebrating 20 years of working together to ensure California’s education system meets the needs of English Learners. Through their tireless work, they have achieved great victories, successfully changing policy and the academic environment in schools all over California. celebrate with the over 20 organizations of teachers, administrators, board members, parents, civil rights non profit groups, that came together after the passing of Proposition 227 in 1998 and have successfully changed the way people across the state talk and think about the assets and needs of English Learners. become inspired by the stories of struggle and success that have reversed perceptions and have helped communities across the state begin to see English Learner students bringing their assets of their language and culture to our schools and their communities. 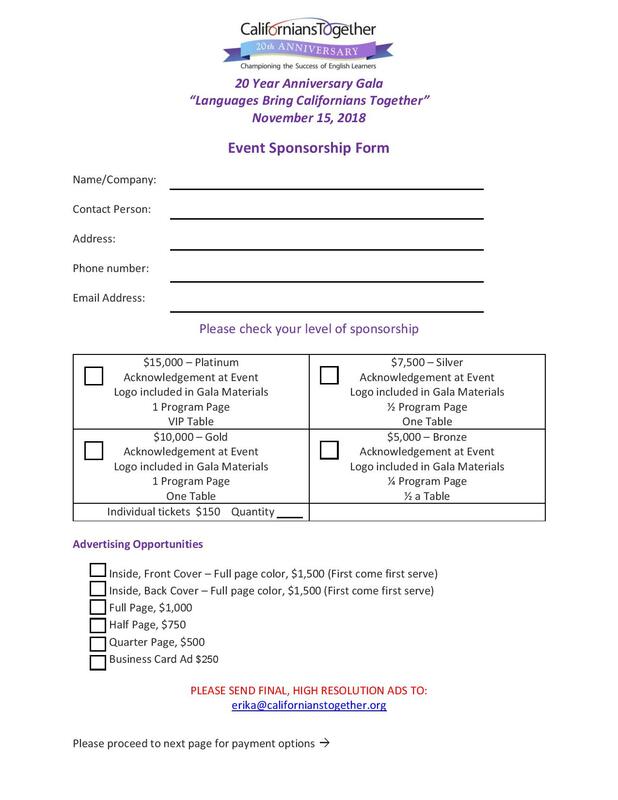 associate with and increase your brand exposure among the leaders, experts and influencers that work day in and day out to make sure that the resources and supports are available to make sure English Learners and all California students become the multilingual leaders that our communities will need in the 21st century. As a result of the work of Californians Together, in 2012, California became the first state in the nation to award a State Seal of Biliteracy to graduating seniors with demonstrated proficiency in two or more languages. Today, over 200 California school districts are currently granting the awards and 31 states plus the District of Columbia have formal State Seal of Biliteracy programs. 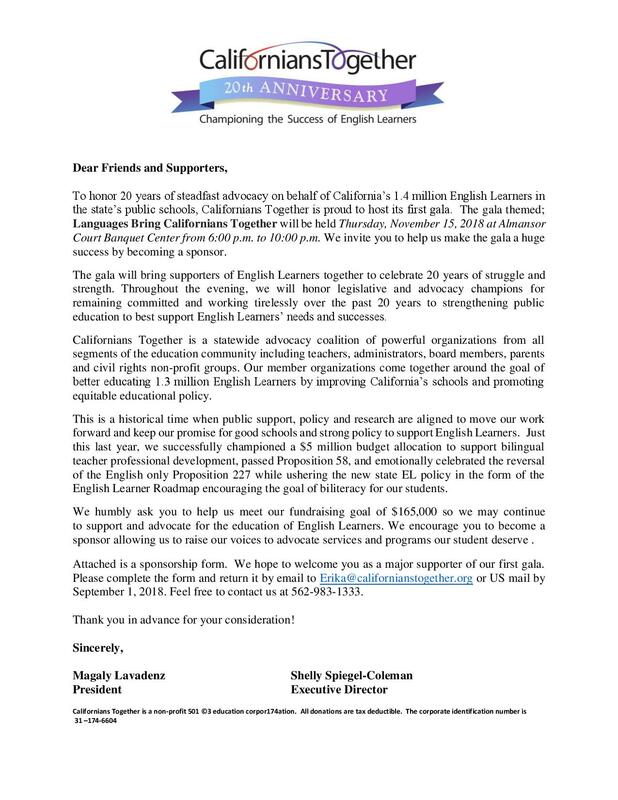 Californians Together research and policy work created an urgency for the state and nation to focus on Long Term English Learners who despite many years in our schools are still not proficient in English and are facing major academic deficiencies. 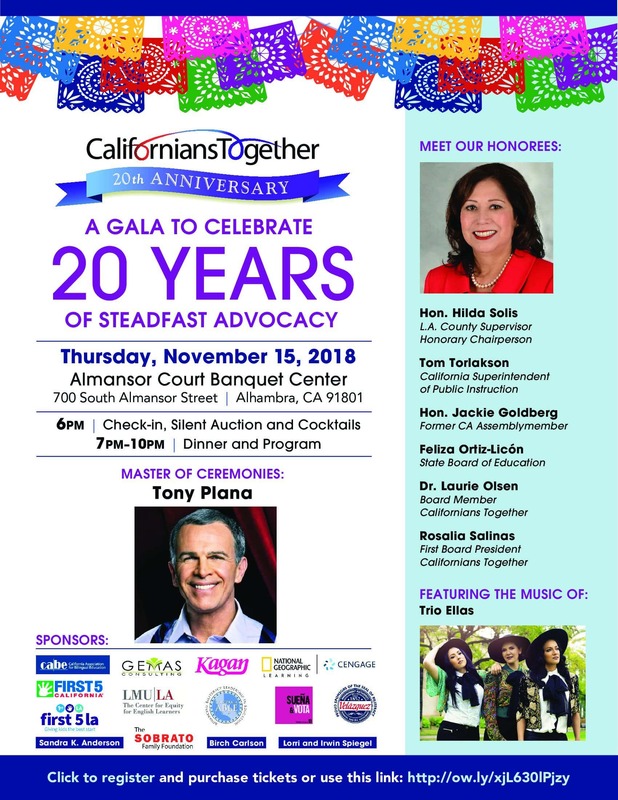 As Ed Week pointed out, "Californians Together is the brain trust behind the bill that catapulted the long-term English Learner issue into the national spotlight a few years ago with its report showing that large numbers of such students were languishing in California's public schools and made these students visible for districts and schools. The need for the important work of Californians Together to bring change in policy and practice for the education of English Learners is greater today than ever before. Our member organizations have been and will continue to be at the forefront of the struggle to ensure students achieve biliteracy and high levels of academic achievement.